The Cottage is in a secure complex with a narrow road leading to the front of the house parking, a small car is strongly recommended. The properties we have chosen are where I too live with my husband, Bertus and our 2 French poodles. The area is called ‘Green Point Village’ and its located on the Atlantic Seaboard. This is one of the most beautiful parts of Cape Town as you have Signal Hill behind you and the beautiful ocean – with Robben Island- in front of you. The Green Point Park and Promenade –which stretches from Mouille Point all the way to Camps Bay (and even further for the truly adventurous) is within walking distance to our properties. The V&A Waterfront too is walking distance but most people drive (or catch an Uber especially on the way back) as they have done so much shopping J We have amazing restaurants in Cape Town, it REALLY IS FOODIE HEAVEN!! Not to mention our amazing wines which complement the food J . Nearby are amazing Artisan Craft beer and coffee shops. For those who are active –Lions Head and Table Mountain are basically our back garden. We are also very close to the infamous Camps Bay and Clifton beaches which are picture perfect albeit that the Atlantic is a tad colder than the Mediterranean but then again our sun is a lot hotter too so getting into that refreshing crystal clear blue water is just what the doctor ordered on a hot summer’s day J . We have a cultural side too mind you –amazing galleries and we are soon to have the Zeits Museum of Contemporary Art Africa – the world’s largest museum dedicated to modern art on the continent also situated at the V&A Waterfront. I look forward to hearing from you and sharing our properties and more of my travel tips with you. In front of Cottage, driveway very narrow. Not suited for big cars or SUV's. Wifi is available, name and password will be in the information book, located in side the Cottage. You're walking distance away from most of the City's urban delights - Green Point Park, Sea Point Promenade, V&A Waterfront and of course, the ocean! 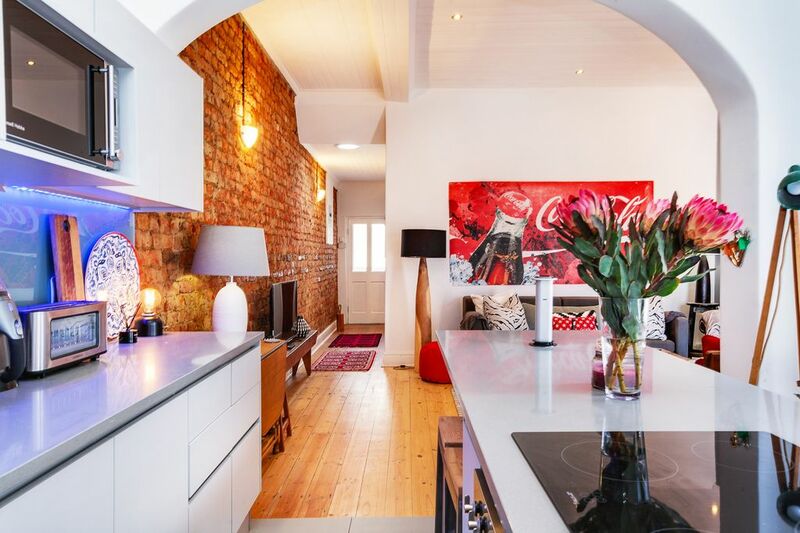 The house sits on a safe and quiet street, a gentle stroll away from Green Point's supermarkets, delis, bars, burger joints, butcheries, pizzas and ice-cream parlors. It's also a very short drive away from the CBD on one side, or Clifton, Camps Bay and beyond on the other.